The 7th Pairs Competition, run by the Cornamona & District Anglers Association, in aid of Galway Hospice was held on Sunday 27 April in conditions that were far from favourable – blue skies, bright sun and calm conditions. However, fish were caught either in the first or last hour and 26 teams (52 anglers) caught a total of 28 fish. Record rainfall in February had Lough Corrib at heights seldom seen (See Fishing Gallery). As the level of the lake can be controlled, to some degree, at the Weir in Galway city with all sluices open the Lough has dropped rapidly and is now at much the expected level for the time of year. Duckfly fishing, whilst considerably better than last season, rarely reached peaks of previous years. Early duckfly fishing was slow with the quantity of duckfly hatching quite patchy and scarce. Later fishing improved slightly and one would have to say that the duckfly season, overall, was not up to our normal expectations. The average size of fish, however, was excellent with the fish generally in great condition. Olives, and some mayfly, began to appear about 23 April and the wet and windy conditions of Friday 25 and Saturday 26 provided some excellent fishing mostly to Sooty Olive patterns. As I write, bright sunny and calm conditions prevail with most fish (some to 5lbs.+) being caught on buzzer patterns. The more normal weather pattern of this year, contrasting greatly with last year and the year before, means that I expect our olive and mayfly fishing to be right on cue – neither early nor late. 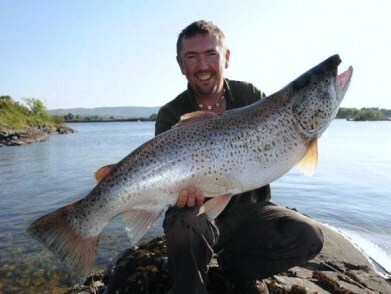 The new season for brown trout fishing on Lough Corrib commences on 15 February 2014 but, as Roy hopes to be chasing bonefish at that time, it will be mid-March before he launches the boats on the lough. Having had a very dry autumn and early winter, we have experienced deluges of water over the past 3-4 weeks with several gales and the lough is well up at winter levels with the jetty now completely under water. Thankfully, we are not in any danger of flooding but there have been reports of serious damage and flooding all along the western seaboard and many rivers have burst their banks. We are now taking bookings for the new season and the best way to check on availability etc. is to contact us by email. However, until the season opens, you might like to check out Roy’s three DVDs called Corrib Seasons: Spring, Summer and Autumn, made with the assistance of camerman and editor Reginald van Acker some years ago and originally issued on video. The DVDs are available to purchase on-line – see Offers page – and can be bought separately or as a set of three and cover a complete season’s stillwater fly fishing. Also on the DVDs is a demonstration of the tying of flies used by Roy whilst fishing. 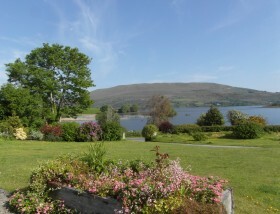 The tyings are done by Paul E. Douras, a regular visitor to Grasshopper Cottage, who has experienced the joys, and frustrations, of fishing on Lough Corrib throughout the entire season. Wishing all our readers a Happy New Year and ‘tight lines’ during the coming season. The hottest July on record successfully destroyed any worthwhile fishing both on rivers and lakes. As water temperatures rose, the trout became virtually impossible to catch, even fishing deep did not appear to be that successful. The good hatches of sedges, late evening and into the night, could not entice significant numbers of fish to come to the surface to feed. Only in closer proximity to deeper water did the angler stand a chance. Now the weather has broken the trout may take some time to reappear as water temperatures still remain exceptionally high. 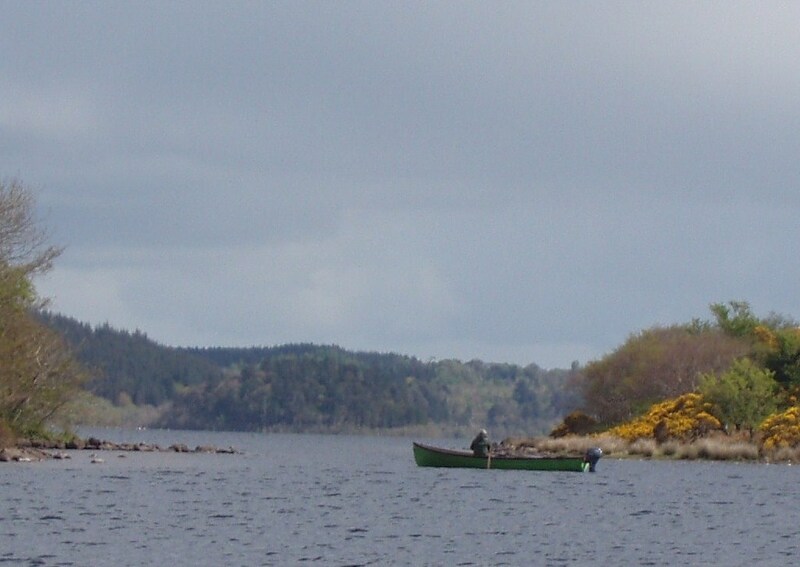 Normally, at this time of year, fly fishing on Lough Corrib goes quiet. Following the unpredictable nature of the lake this season, fly fishing (especially wet fly fishing) has been particularly good. The apparent absence of perch pin fry, coupled with the mixed weather conditions, has provided some excellent sport – perhaps the best wet fly fishing of this season so far. Trout are responding well to a whole selection of patterns. Mayfly have continued to hatch throughout the month and fish have been eager to take them. Dark sedges, of all sizes, have also been popular. A further added bonus has been the arrival of possibly the best run of grilse into the lough for several years, particularly in this past week. These are being caught not just by traditional trolling methods but also on fly patterns. I had thought that successful fly fishing for grilse on the lough was a thing of the past but, so far this season, things look very promising. The anticipated ‘big bang’ of Mayfly never happened. Cold temperatures and varying winds gave two weeks of stop/start mediocre fishing the mayfly never being held on the water sufficiently long for the fish to become really interested. All anglers have reported catches of notably small fish with “dappers” faring best for the larger fish. The week ahead with its promise of warmth and light winds should provide the dry fly enthusiast with some good sport. As the Mayfly progresses, the early hatches of Corr na Móna and Dooras have dwindled and we are having to travel slightly further afield to get best sport. Evening fishing over this coming week could give us some excellent sport to spent gnat and dry buzzer. Another frustrating week -anglers kept waiting for weather conditions and Mayfly. Should I declare the Mayfly up? Just about. Small hatches of mayfly in sheltered bays providing some sport for persistent anglers. Olive hatches much improved and trout responding to both dry fly and wet fly when conditions allow but, what a dreadful week weather-wise. Bright and blustery conditions with rising water levels conspired to frustrate anglers. Despite the continuing cold conditions, the week ahead looks promising for both Mayfly and Olive fishing. A week ago I saw half a dozen mayfly hatching in a shallow bay whilst I was having lunch. Normally one could expect to see more mayfly day on day. Not so. Heavy rain brought lake levels rising again coupled with continuing cold. The Mayfly have decided to keep us waiting! The few olives that are hatching, fish seem keen to take them – hopefully an encouraging sign for the week to come. Strangely, those dapping artificial mayflies (naturals not available) are having some success. Anglers that came early this year returned home very disappointed. Just goes to show that no two years are ever the same as the week gone past (April 28-May 5) was probably the best week of the entire year. The Hospice Pairs Competition took place on Sunday 28 April and 62 anglers or 31 pairs set out from the Carrick Shore. The event is run on a ‘catch and release’ basis with fish length being used to score. The popular winners were Joe Crane, Roundstone and Seamus Kelly, Oughterard with 6 fish for 1,180 points. A full report can be seen by following this link to the Fishing in Ireland website, http://fishinginireland.info/news/trout-reports/olives-just-starting-to-appear-on-corrib/ Two anglers who regularly fish from Grasshopper Cottage won 4th prize – see photos in the Fishing Gallery. In the Dooras section of Lough Corrib, we can normally count on duckfly for our early season fly fishing. Normally, I say, the duckfly hatch lasts for approximately three weeks between mid-March and the end of the first week of April. This year, however, whilst a few fly appeared after St. Patrick’s Day, early anglers were very disappointed. As I write, 22 April, there are still remnants of the duckfly hatch with no sign of olives or, dare I say, mayfly. I am remembering this time last year when we had excellent mayfly fishing from about 16 April onwards. How different can two consecutive years be! Duckfly fishing this year, whilst protracted in time, rarely saw fish coming to the surface as usual. The average size and condition of the fish was excellent but the numbers of fish caught was very disappointing. The best results came to deeply fished buzzer patterns. So what happens next? That is the big question on everybody’s mind. The weather changed just over a week ago bringing much milder, though by no means warm, and wet weather. The lake rose, from being at an exceptionally low level, by nearly 12″ in a week. Traditionally we have always said a rising lake seldom provides good fishing and last week was no exception. A rising lake also has the effect of slowing down hatches of fly to come, in this case, hatches of olives and mayflies. I really cannot say what will happen from hereon out. If the weather stays cold I expect mayfly and olive hatches to be delayed. However, should it warm up substantially, the season might just get back on cue. The forecast for the week to come is not too encouraging, as I note that the weather is to get colder again (from the north) at the weekend. In the words of my good friend, Malcolm Patrick “Don’t worry – it will happen”. Let’s hope for the best! After the very cold winter of 2010/11 (one of the coldest on record in this part of the world) what a change the winter of 2011/12 brought recording one of the warmest winters on record. It does appear as if all our weather and climate had changed to one of extremes. The very mild winter caught everybody out – daffodils in January, mowing the grass in February and the very earliest duckfly I have ever seen (10-11 March 2012). Despite what appeared to be a good quantity of duckfly, the trout were very obviously unresponsive with little or no surface activity. Normally, the duckfly hatches are a good indicator of what the stocks of trout are like in the lough. This year I was quite worried that fish numbers were well down. Duckfly fishing as a consequence was slow and difficult – even deeply fished buzzers brought little response. However, I need not have worried as, come early April, almost immediately after the last duckfly, the first olives appeared ( a full two weeks ahead of normal). Fish responded quickly and the bay in front of Grasshopper Cottage appeared to be chock-a-block full of fish feeding eagerly on what must be considered a fairly ordinary hatch of olives. Mayfly appeared a full two to three weeks earlier than normally expected. 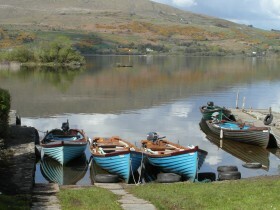 The few anglers about could not believe their luck as the lough was virtually empty of boats. Nobody believed our stores of excellent mayfly fishing as early as April 15 and a few of us thought that, being so good so early, it could not possibly keep going for very long. It is fair to say that the best mayfly fishing was experienced during the last two weeks of April, long before the fishermen traditionally arrive for the Mayfly season. At the end of April, the year seemed to go in to limbo – the weather got colder, plants and shrubs stopped growing and fishing became sluggish. Despite the drop in temperature mayfly continued to hatch. Their survival rates must have been very low, due to the cold, as very few spent gnat were seen at this time. The cold seemed to slow down the mayfly season with hatches of fly becoming patchy and localised. It also had the effect of prolonging the season through May and June and on into July. Another feature of 2012 was that the water appeared exceptionally clear. Wet fly and dry fly anglers struggled whilst the dappers, when conditions allowed, fared much better. In the north-west section of Lough Corrib, where Grasshopper Cottage is located, those anglers who were fishing buzzers found fishing hard going whilst the story at the southern end of the lough, towards Galway, was very different with some spectacular buzzer fishing. The season continued in fits and starts in our region although the lower part of the lough fished much better. Lough Mask fared much the same as we did except those anglers who fishing daphnia in the deep did quite well whilst anglers fishing the shallow water found it much harder to catch fish. Lough Carra, my favourite back-up to Lough Corrib, appeared to me to be lacking in fly life compared to other years. However, in my view, fish caught were larger than normal but I couldn’t say that catching them was easy. Night-time sedge fishing on Carra provided some excellent sport. The highlight of this trout fishing year, for me, has to be Ceri Jones’s magnificent ferox trout of 23lbs. 12oz. (10.77kg ) caught on deadbait on Sunday 27 May whilst trolling near Inchagoill Island – a just reward for the exceptional number of hours successful ferox fishing demands. In general, the run of salmon/grilse was poor resulting in relatively poor catches throughout the region. So what shall 2013 bring? So far it has been an exceptionally mild winter to date, 1 January 2013, but – a word of caution – it could all change yet. Lets keep our fingers crossed for a more ‘ natural’ year – if such a thing exists anymore! Wishing you all the best and ‘tight lines’ for 2013.